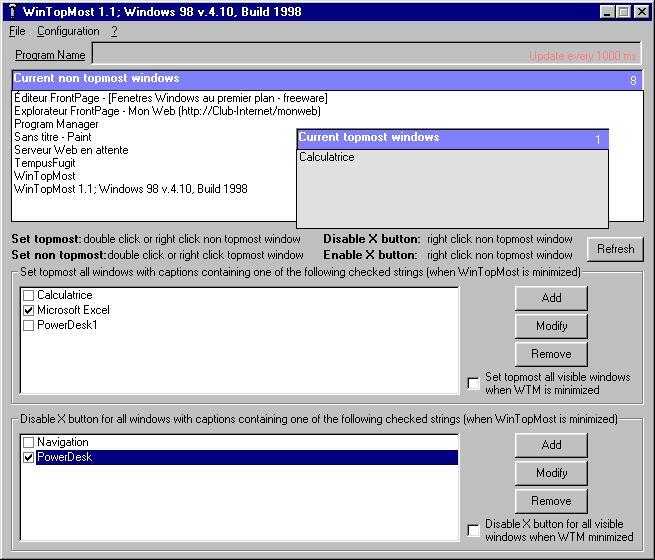 This feature can secure connections for example using Telnet or preventing impatient users to cancel a DOS batch and consequently causing abnormal termination and exit from dos programs under Windows XP for example. B) WinTopMost also lets you manage topmost applications to be always visible on your desktop i.e. front end of all other windows displayed. When clicking the Close button (or pressing Alt+F4) closes the window. In some cases, you may not want to allow the user to close the window in this manner. WinTopMost offers the possibility to control those programs or just some of their windows hat you prefer to secure and force the user to close via the options of the menu bar. WinTopMost can also be used for its topmost feature to choose one or more programs to stay always on top of your desktop so that the current window is not hidden by another active program you launched after; of course your continue to be able to put this selected topmost program as a minimized windows or to switch it to a non topmost one when you want. Unlimited Corporate License : 845 $US allows companies to run it on all Windows computers in interactive or command line mode without any limitation on number of installations. The software is able to automatically set topmost any window using its caption and based on a specific characters string. WinTopMost intercepts windows captions when programs are running (you can specify and detect many strings and set topmost different kinds of windows). Disabling close buttons can be set up automatically according particular windows captions containing specific strings. WinTopMost analyzes windows caption titles of programs running on your desktop (can work with many strings and set close button inactive for several windows). You will also be able to use it in command line mode for example included in a batch, without interface, not visible in systray : "WinTopMost - i". To avoid a second WinTopMost instance just type: "WinTopMost" -i -s"
Easily setup parameters and then let WinTopMost pilot how program instances work on your desktop whether or not the close button (X) will be disabled on screens. Calc (Calculatrice) is now topmost. See also the other utilities from Soft Experience for Windows-Macintosh file management on Windows computers or servers. MacNames : helps Windows-Macintosh cross-platform integration . This specialized Windows application is able to rename automatically Macintosh files stored on a Windows NT or 2000 Server, removing illegal characters and adding filenames extensions; then Windows can identify the appropriate applications associated with renamed files. Idem : automates file synchronization and directory replication for Windows and Macintosh files stored on NT/2000/XP workstation or servers. Delenda for daily cleaning or transfer of the contents of a list files and folders on a workstation or on a server depending on files dates and age old (creation, modification, last access). Download the Chicago - Dusk to Dark Screensaver! EasyConsole : run MSDOS commands from a Windows screen, save them on buttons for future use with a simple click.